4Easysoft Video to MP3 Converter is designed especially for users to convert any popular video to MP3 and some other audio formats. 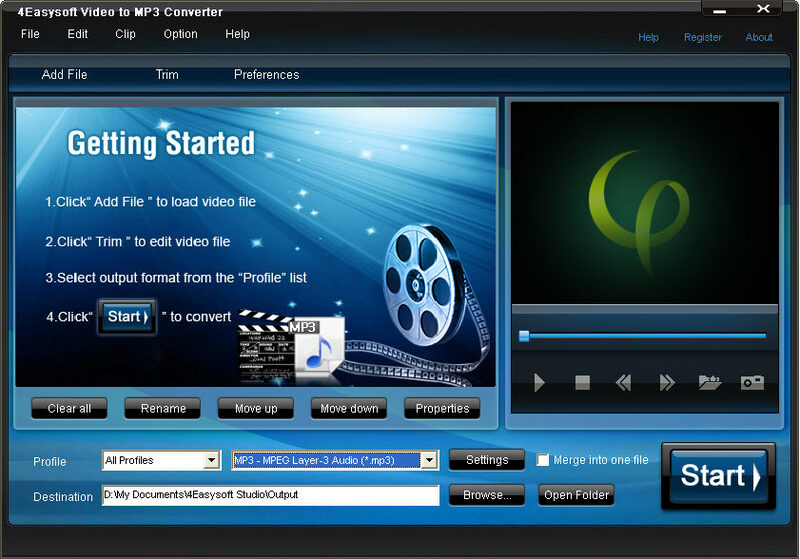 This MP3 Video Converter can help you convert video MP4 to MP3, AVI to MP3, WMV to MP3, etc. More than a Video to MP3 Converter, 4Easysoft Video to MP3 Converter is also the best video/audio editor that packed with powerful editing features like trim, merge, etc., which will assist you to recreate video. 4Easysoft Video to MP3 Converter is the best MP3 Video Converter to convert all popular video formats to MP3 and other audio formats AAC, AIFF, FLAC, AU, OGG, etc. for different MP3 players. With this Video to MP3 Converter, you can freely convert among different audio formats so as to get the audio file you want. This Video to MP3 Converter can help you convert video to MP3 for different MP3 players like iPad, iPhone, iPod, PSP, Creative Zen, BlackBerry, etc. It is easy for you to convert part source video to output MP3 audio by setting the exact start and end time of the part MP3 you want. 4Easysoft Video to MP3 Converter has the ability to join several video files together for you to output a long movies. Detailed audio settings are provided for you to choose like Audio Encoder, Channel, Sample Rate and Audio Bitrate. All these settings can be saved as user-defined profile for your later use. With this Video to MP3 Converter, you can choose audio track for the output MP3 audio. 4Easysoft Video to MP3 Converter is easy to use with best quality and fastest speed, which brings you a wonderful experience of video to MP3 conversion.